Take one of the most theatrical supercars on sale, sand down a few of the roughest edges of its character and change almost nothing about its space-age looks. You’ve got yourself the new Lamborghini Aventador S.
Well, not new per se, but lightly facelifted in 2017 to incorporate parts that aim to improve the Av’s major failing: it was a bit of a brute to drive. However, there’s a delicate balance to be struck here, because we wouldn’t want to see what could be perceived as ‘character’ being replaced by a more anodyne nature. A world without wide, unruly, visibility-bereft V12 Lamborhginis would undoubtedly be a step backwards for mankind akin to canning Concorde. The addition of rear-wheel steering is the major change. Counter-rotating rears tighten the turning circle at low speed, while driven quicker you find all four wheels turn in the same direction, which effectively lengthens the wheelbase to improve stability. This isn’t new tech, but it is effective in lending the Aventador S an approachability that was hitherto absent. Its rear magnetic dampers have been retuned too, and the all-wheel drive system is more rear-biased to improve driver engagement. It’s a far wieldier thing with these tweaks; less prone to diving nose-first into bends and still compliant in all modes, despite 20% stiffer springs. But don’t go thinking the S is any softer than the standard Aventador Roadster: it’s still a gloriously impractical, hard-edged prize-fighter of an Italian supercar. The gearbox helps keep things proper. It’s the very same seven-ratio automated manual transmission as before, and as before there’s a long delay between shifts. It’s this that separates the Aventador S from its rivals; if you’ve driven a twin-clutch-equipped Ferrari it’s a chalk-and-cheese as the two firms’ styling languages. We found the smoothest way to drive the S was to lift off the throttle just before each gear change – as you’d expect given this is in effect a manual gearbox. It’s best controlled using the column-mounted paddles, too, rather than leaving the car to decide when to change for itself. The shifts are so ponderous that you’re better off being master of your own automotive destiny. Besides, the ability to hold this wonderful motor at any given rpm should be a basic human right. It’s your civic duty to ensure as many people hear its party piece as possible. It starts at lower revs with a burbling idle bristling with potential energy as those two banks of six get the crank spinning, but between 2-3000rpm the excitement levels take their first leap. The engine yelps into a wail that teleports you directly back to the V12 F1 engines of the mid ‘90s. You’ve got the same suite of drive modes as before, but there’s now an Ego setting (translated to English: ego) that allows the driver to pick their own configuration for the drivetrain, steering and suspension. Thanks to the accuracy and performance of those magnetic dampers, though, we found up-to-eleven Corsa worked for most situations. Our only issue was with the variable-ratio steering, which tended to tug left and right aggressively at times, even when driving in a straight line. It had us minded of Afla’s 4C’s unruly front end. Thankfully that’s basically where the similarities end, though. Inside the Aventador S has a far nicer and more distinctive cockpit design than even its R8-based stablemate the smaller Huracan. 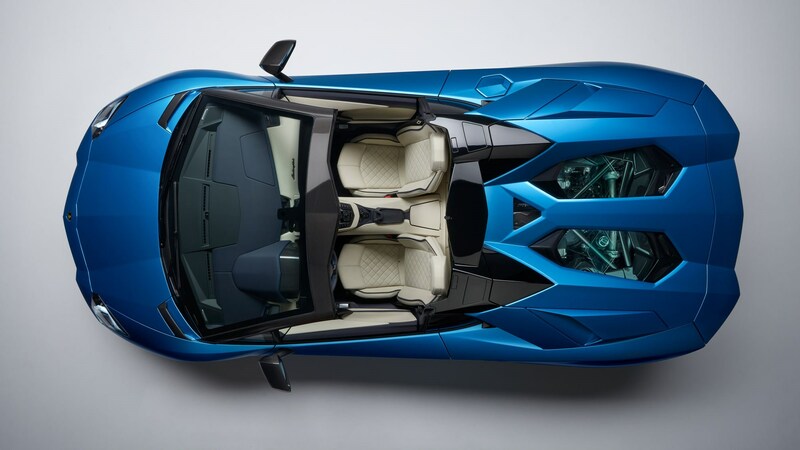 This helps the larger Lambo feel much more exclusive – but the scissor doors (on V12 Lamborghinis only) are the biggest giveaway that this is Sant’ Agata at its best. There are a couple of issues, though. First and foremost is the roof, which comprises two panels that need manual removal. They’re designed to be stored in the front luggage compartment, but you won’t get anything else in there at the same time. Best simply leave the 6kg carbonfibre panels in the garage and pray for no rain – or simply keep the car at your summer house in a hot climate. Problem solved. The other is the driving position, which is noticeably less adjustable than the Aventador coupe’s. There’s still decent space in there (unlike the Huracan) but we struggled to find a sweet spot where the top of the windscreen, the steering wheel and the instrument panel were all in the perfect position. The changes to the Aventador in its maturation to S specification don’t rewrite the rulebook, but do a great job of making a wild child just that little bit easier to live with. 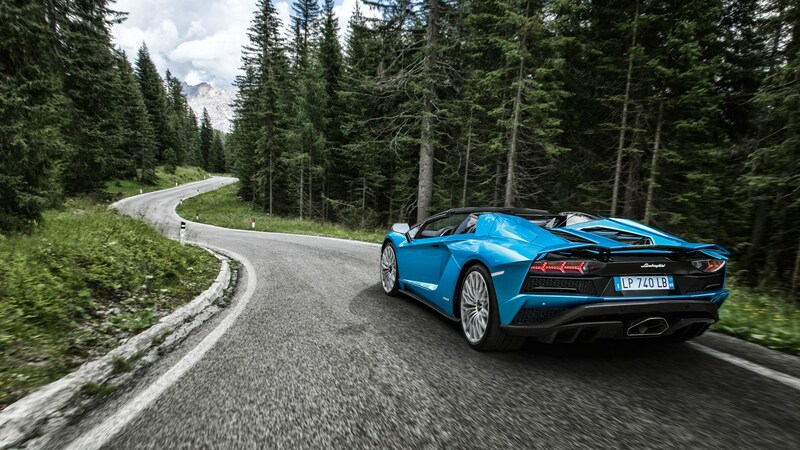 It’s still uncompromisingly exciting, and for that Lamborghini simply must be applauded.